Who gets jobs in video games? This is an interesting question. The obvious answer is the best programmers or the most talented artists. This isn’t the whole story though. Yes, if someone graduates top of the class at a well respected university, with a first class degree and stunning demo’s the likelihood is that they will have a good chance of making the grade. This background isn’t an absolute guarantee of a job, though. In the same way I’ve seen people with far less impressive academics and less developed demo’s get ahead in the job market. The fact is that in a competitive market it is not just about what you are selling, but how you are selling it that is important. What I want to do here is to get people thinking a little more strategically about what it takes to get a job in such a competitive industry. Think sniper rifle not machine gun. Remember that sending a CV to a company should only come after careful consideration and research. 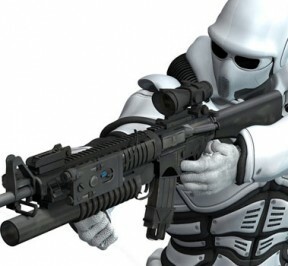 You only have a limited supply of ammunition – one shot with each potential employer, so when it comes to actually firing off an application you mindset needs to be that of an elite sniper rather than a machine gun wielding loon! Get your equipment ready – Think about your brand and how to maximise the impact of the skills and experience you do have. Getting together a basic CV, LinkedIn profile, website and social media presence is vital. Remember – you don’t need to spend too much time on the CV at this stage as each time you make an approach to a developer you will be tailoring it to suit them. Make sure your sights are set – The key to successful approaches is to lay the groundwork well and avoid sending a speculative CV out cold. Approaches that are targeted to the right person and that are well thought out and informed are far more likely to be reviewed positively than a generic approach to a “jobs@” email address. To do this we must start building bridges via networking before a CV is even sent. Wait for the right moment – All companies have periods in the development cycle when they are more open to hiring different types of person. If they are in crunch time before a milestone there is a chance they may look to hire a very experienced contractor who can hit the ground running and add value to the team straight away. They are unlikely to have the time to bed in a fresh graduate at this point no matter how good an approach you make. Look for the signs that let you know they may be ready to bite. Fire – Only once you’re confident that everything is right, take the shot. Forget? – No. OK – maybe the sniper analogy is getting a bit forced now. Apologies! OK sometimes you will make the headshot – a meeting request comes back and you start preparations for the interview. More often than not you’ll need to do some effective following up to make sure things are progressing how you want them to. Use the discount code debug10 for 10% off the cover price.